Introducing Hi-Tech Pharmaceutical's newest testosterone boosting supplement, Tribesterone! 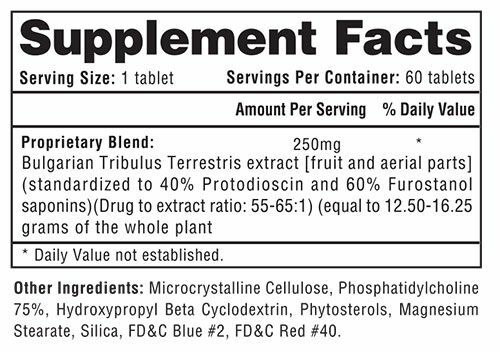 Tribesterone isn't like your other Tribulus based products. Hi-Tech's Tribesterone contains higher Protodioscin. Protodioscin is a steroidal saponin compound found in plant species, like Tribulus. Not to mention, Tribesterone features key furostanol steroidal saponins. Unlike other Tribulus products that claim to have 40% of only saponins. Tribeserone features 40% Protodioscin and 60% Furostanol, key steroidal saponins. This is important for stimulating the luteinizing hormone that will increase testosterone. What Can I Expect From Tribersterone ? How Do I Take Tribesterone? As a dietary supplement, take 1 tablet of Tribesterone twice daily with meals. Do not exceed 4 tablets daily. We have a large selection of in-stock Hi-Tech Pharmaceuticals products including Muscle Builders items and others for the lowest prices at SameDaySupplements.com® It's always easy to shop for TRIBESTERONE® BY HI TECH PHARMACEUTICALS® at SameDaySupplements.com® because you can browse by reviews, brand, prices or search for specific ingredients using our search tool. In-stock orders placed before 3pm EST ship out the same day to USA, Brazil, United Kingdom, Canada, Germany, Australia, Japan, India, France and worldwide at the cheapest prices online.